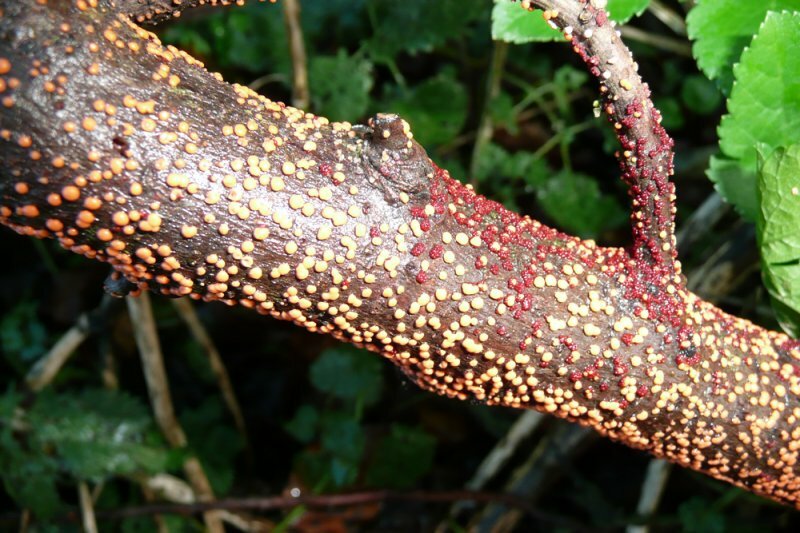 Raised, salmon-pink pustules appear on the branches of trees and shrubs, particularly on and around dead wood (eg from die back). 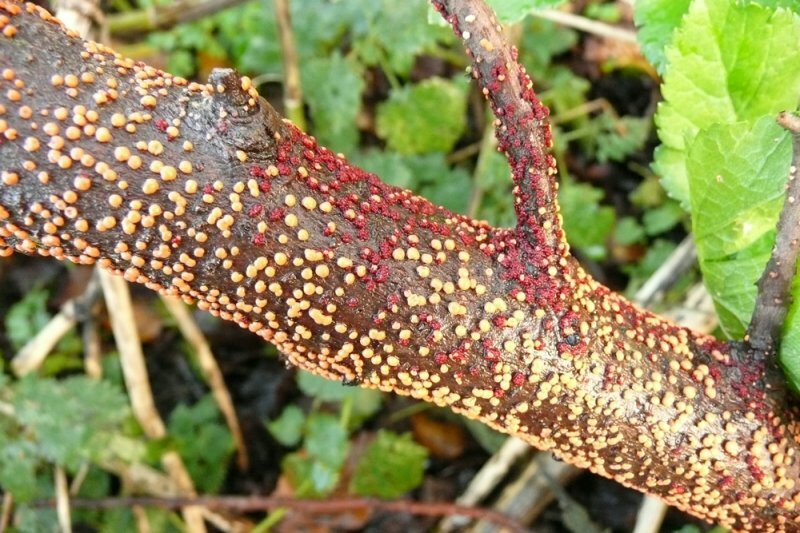 Sometimes (usually in spring) similar red pustules appear which look like minute raspberries. Large branches may wilt in summer if affected near the base, which can cause a canker and resulting in girdling dieback. On many trees and shrubs including acers, aesculus, apples, beech, cercis, currants, elaeagnus, elms, figs, gooseberries, hornbeam, limes, magnolias, mulberries, pyracanthas and walnuts. It rarely affects conifers. It breeds in dead wood (eg on old pea sticks), air borne spores then infect living trees and shrubs through wounds or lenticels. It’s caused by a relatively weak fungus, so if a plant is infected it might suggest another underlying problem. Ensure that dead wood is removed from trees and shrubs and isn’t left lying around where it could become infected and in turn infect living plants. The fungus won’t infect living wood directly, but through dead parts of pruning cuts, especially in early spring and in damp conditions, from which it enters the water transport system (the xylem) and spreads throughout the plant. Pruning in dry weather only and ensuring that all pruning cuts are made cleanly will help to prevent it. Cut out any infected areas, removing the wood well beyond the external sign of infection (at least 15cm) and burn. Burn any subsequent prunings until you are comfortable that the disease has been eradicated. If the plant is easily replaceable it may be best to remove it altogether and burn it. There is no chemical control available. This fungus is a ‘saprophyte’ – it lives on dead organic matter.